It's always an honor to be asked to be part of or contribute to a wedding, but it's even more flattering when your culinary skills are called upon for said wedding. In October, Kim specifically requested I bring my "famous potato salad" to her post-Scotland wedding reception, and last weekend, Catherine, Jeff, and all of us wedding guests toasted their happiness with my Lady in Red at the Mandarin Oriental Hotel. Over the summer, Catherine -- for whom I once designed a simple birthday cocktail to go along with her gift of St. Germain elderflower liqueur -- asked if I would shake up a special wedding cocktail. Her only request: it had to be red to match her dress. After first assessing what the Mandarin Oriental stocked in their bar, I set about to concocting the cocktail. Aside from staining its cheeks crimson, I wanted this cocktail to be three things: seasonal, celebratory, and reflective of the bride's tastes. Well, not all of that happened. Ignoring sangria and all other wine-based cocktails of that ilk, I knew that the red hue was going to come from cranberry or pomegranate juice (seasonal! ), and after a few (read: nine) attempts, I ditched the cranberry juice. It was too easily diluted in both color and flavor. I also had to ditch my idea of including both bourbon and ginger ale in this cocktail (the bride's signature drink) because no matter what I did, the bourbon came out too...bourbon-y. A few weeks later, I started with a whole new plan and a whole new red. Now working with the stronger, tarter pomegranate juice, I cried, "Eureka" after three passes and then set to refining the flavors. Shake pomegranate juice and gin with ice; strain into a cocktail glass. Add ginger ale and top off with sparkling rose. Finish with bitters. 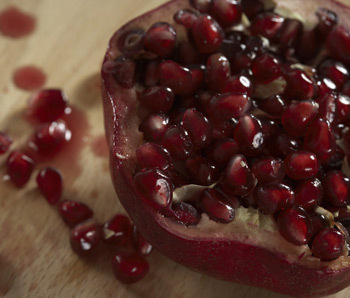 Garnish with four pomegranate seeds for health, happiness, love, and laughter. I am pleased and relieved to report that the drink was extremely well received. Even my French friend, who I thought preferred champagne to everything, was seen drinking more than one Lady in Red. Additionally, the bartender told someone else that he's seen a lot of guest-created cocktails pass through his shaker, but he had never seen one reordered so many times. Finally -- and most importantly -- the bride, the groom, and all my cocktailing friends loved it.